Business Minister Henrik Sass Larsen, who had been due to present the bill today, will now show it to lawmakers on March 18, according to the parliament’s website. New legislation must pass three votes in the chamber before being enacted. “It’s not going to hurt our business as we don’t expect it to prevent our real estate agents from just advising clients to call us,” Flemming Vesterbrandt, a director at Nykredit’s retail client unit, said in a phone interview. 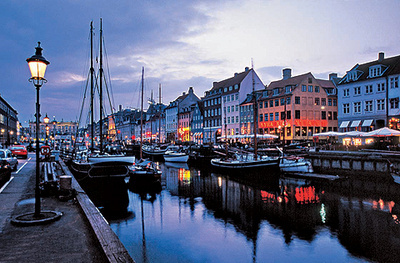 “The law will step up awareness of the role banks play in property trading.” Denmark emerged as Scandinavia’s weakest economy after the nation’s housing boom turned to bust in 2008, sending property prices plunging about 20 percent through last year. The $340 billion economy contracted 0.5 percent in the fourth quarter from the third as consumers cut spending and businesses invested less. The government’s proposal comes as Denmark’s $550 billion mortgage market, the world’s biggest per capita, struggles to adjust to flagging loan and refinancing demand as well as stricter regulatory requirements. Loan demand in Denmark, where households carry the world’s biggest debt loads, slowed last month. Danish consumers owe their creditors 321 percent of disposable incomes, a level that the Paris-based Organization for Economic Cooperation and Development said in November demands a policy response. Denmark’s government and central bank counter that consumer debt is offset by home equity and pension savings, leaving households with net assets. To some animal lovers, it sounds too terrible to be true, but zoo leaders say it's anything but a tall tale. Just days after the Copenhagen Zoo killed a male giraffe named Marius to avoid inbreeding, another zoo said it might follow suit. Jyllands Park Zoo said Thursday it may also have to "euthanize" one of its male giraffes -- coincidentally, also named Marius -- if a female is brought in to breed. Zoologist Jesper Mohring-Jensen told CNN that Jyllands Park Zoo joined the same breeding program as the Copenhagen Zoo last year, which means it can't have too many giraffes with the same genetic makeup. The zoo currently has two male giraffes, he said. One, Marius, is not deemed useful to the program but is a useful companion to the genetically valuable second giraffe, which is in fact an older brother of the Marius killed in Copenhagen. The zoo wants the second giraffe to mate, so it must bring in a female giraffe. "At the moment, they are doing very well and are keeping each other company, but if there are some genetically more valuable giraffes in the program that need the space, we have to decide what to do with him," said Mohring-Jensen. "We will of course try to place him in a suitable zoo, but if that is not possible, we might have to euthanize him. The program will give us notice well in advance, so I think we will have a good chance of placing him." It's thought that no decision is imminent, "so the problem is not acute," he said. A draft EU lighting strategy that would freeze a phase-out of energy-guzzling lamps for two years would hurt clean energy firms, dampen the EU’s environmental legislation and threaten future green laws, according to a Danish Energy Agency (DEA) paper, seen by EurActiv. The document was sent to Brussels in response to a draft Commission document, seen by EurActiv which would postpone a 2016 ban on inefficient 'non-directional' halogen lamps in ‘Stage 6’ of the lighting Ecodesign requirements until 2018. The official Danish paper says: “We cannot support the delay of stage 6 since it would: significantly reduce the effectiveness of the Ecodesign directive, negatively impact the businesses in Europe who have invested and integrated stage 6 into their business strategy [and] lead to uncertainty about other existing and future regulations." It would also “establish a precedent of rolling back regulation” in response to business lobbying, the Danish experts contended. Last November, the Commission said that LED technology was not mature enough to replace non-directional halogen lamps so soon. But according to the Danish agency’s study, compatible LED lamps are ready to replace nearly all halogen and comparable applications. Dimmability is already available for 76% of LED replacement lamps and, by 2016, another 19% of lighting stock with higher luminous flux and size restrictions would also be covered. The remaining 5% of lighting stock was not investigated by the DEA.